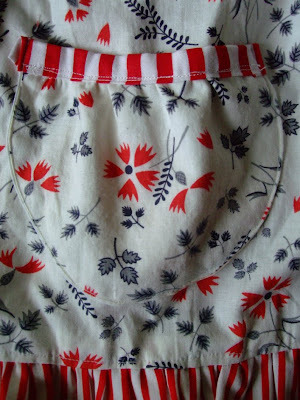 I've had this awesome red, white, and blue flowered fabric lying around for awhile. 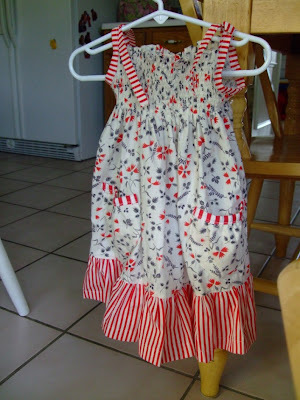 My grandmother gave it to me with a ton of other goodies, and I knew I wanted to make a 4th of July dress out of it. Like the Easter dress, I just kinda made it up with a plan in my head of how I wanted it to turn out. 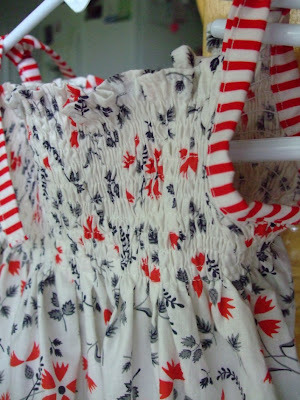 I used a red and white striped fabric (that my gram also gave me) for trim and a ruffle. I shirred the top using elastic thread in the bobbin of my machine. There are a ton of tutorials online about how to do this. It's really easy once you practice it a little bit. I'm showing a close-up of the pocket above, even though I know it is terrible. The trim is uneven on the left and I had to do two lines of stitching across because it didn't catch the back on the first go. Chess really loves pockets, though. And it just goes to show it doesn't have to be perfect to be loved, and it's hard for most people to see the mistakes, usually. There it is in action. I tied the straps in an X on her back instead of straight on the shoulders as an after-thought, so they wouldn't fall down. I should have planned ahead for that, though, because it makes a big gap in the back. Oh well. And here is the easy star-banner! I had so much fun making this. Did you know you can cut a nearly-perfect star out of a piece of paper with only a few, easy folds? Learn how here. That was all the decorating I did this year, but I like it simple. 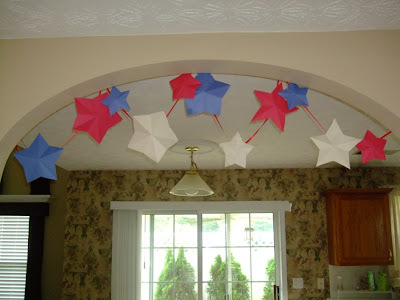 You could use the stars for so many different crafts, all year long. Enjoy! LOVING THE CRAFTINESS!!! I also love the directions helps! 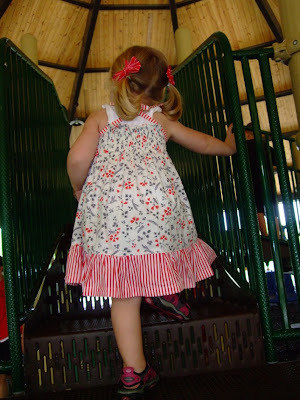 I'm feeling inspired to bring out the sewing machine!! !